Concrete Restoration would like to provide all of its clients and potential clients with the following information on concrete deterioration and repair. If you have a question or would like to speak with a concrete deterioration repair expert call us today at (301) 261-4933. If you prefer, you can click here and contact us online. Otherwise, keep reading to learn everything you need to know about parking garage concrete degradation and deterioration. The presence of chloride in concrete greatly accelerates the development of corrosion. Walls and columns can suffer distress from water penetration and the spray of salt-contaminated water. So, what are the causes of concrete deterioration? 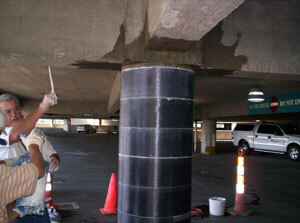 Cracking of concrete occurs primarily due to shrinkage of the material as it cures. Cracks can also form as the concrete is saturated then freezes and thaws over the winter months. This is known as thermal cracking concrete. These cracks create an avenue for water to travel deeper into the surface and reach the reinforcement more easily. The presence of chlorides in the concrete can occur from both internal and external sources. Internal sources are calcium chloride admixtures used during the winter months to accelerate the curing of the concrete. External sources mainly occur from the application of de-icing salts. During the winter months roadways are treated with de-icing salts and these salts are carried into the parking structure by vehicular traffic. Rock salt damage to concrete occurs because of salt’s hygroscopic nature, which causes concrete to absorb more water than it would otherwise. As the reinforcement corrodes, rust develops and the volume is greater than the original volume of the steel. The volume change exerts pressure on the surrounding concrete. Over time this process continues until the pressure exerted by the rust results in a subsurface horizontal crack in the slab. The horizontal crack is known as delamination and is not visible to the naked eye. Eventually the concrete delamination results in a spall due to the continued corrosion of the reinforcement and the forces of the freeze-thaw cycle. Two common techniques for detecting delaminated areas of the slab, not visible to the naked eye, are electromechanical sounding devices and chain dragging. By far the most economical and common technique is the chain drag. A chain dragged over the surface of the slab produces a distinct hollow sound when the chain passes over a delaminated area. If the degree of corrosion to the reinforcement is of concern, corrosion mapping should be undertaken. Half-cell potential measurements serve as an important means of determining the probability of corrosion activity on the reinforcing steel of the structure. Using this technique can help determine probable corrosion areas and the percentage of the total area subject to corrosion. The amount of chlorides in the concrete can be determined by sampling the concrete at various locations and testing them for the concentration of chloride ions. Dust samples are the most typical sample type. A drill is used to pulverize the concrete into a dust that is collected at different depths below the surface. The chloride content at the level of the reinforcement is most important. The American Concrete Institute or ACI has established 0.3% of chloride content in concrete, by weight of cement as the maximum chloride content for corrosion protection. The ACI recommendation is a minimum of 2 inches of concrete cover over embedded reinforcement to reduce the amount of water and chlorides that reach the reinforcement. 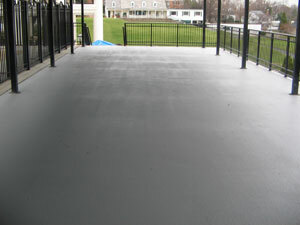 Additionally, most specialists recommend a concrete water/cement ratio that does not exceed 0.40. It is also recommended that parking garages be washed periodically—at least once a year, preferably in the spring after de-icing salts have accumulated in the garage and before that have a chance to permeate the concrete. Additionally, joints and cracks should be sealed to prevent the easy migration of chloride-laden water to reach the reinforcing steel or other parts of the structure. The sealant should be periodically checked for deterioration and replaced as necessary. Most sealants, under normal conditions, will last between three and five years. Cracked concrete is not only found in parking garages. As a matter of fact, we perform concrete block repairs as well as concrete sealing in many different structures in Maryland, DC, and Northern Virginia. 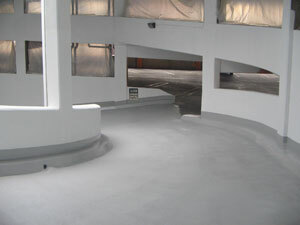 If you need a concrete restoration specialist to repair concrete deterioration in your parking garage or other concrete structure, call us today at (301) 261-4933 for a free cost estimate. Concrete Restoration has been assisting Mid Atlantic businesses and industries with superior service and affordable solutions for structural issues since 1981. Contact us today and learn how we can help you!